Still-and-video hybrid cameras tend to fall between two stools. Will this speedy new Casio get over the stools and take up the throne? It's a dismal time to be a compact camera maker without a foothold in the lucrative SLR market; slumping sales, combined with competition from camera phones, are slashing formerly fat margins. So thumbs up to Casio for having the cohunes to bring out this genuinely innovative compact. It has two big selling points. Firstly, it's impressively fast. The appropriately named F1 can fire off 60 full-resolution frames per second, which is better than any comparatively priced SLR. In fact, Casio is claiming that this is the world's fastest compact. The other ace up its sleeve is video. We're talking 1920 x 1080 pixel quality at 60fps, and the inclusion of an HDMI port means that the video is a cinch to play back on a TV or PC screen. With such specifications, will Casio succeed where Sanyo failed and meet the demand for a stills/video hybrid that's a genuine jack of all trades? Let's begin with handling. The F1 is hardly bulky, but it's certainly as big and heavy as an entry level SLR with kit lens. The whopping 12x optical zoom lens clearly adds to the weight, but it's well integrated into the body. The mode dials and menus are clunky and esoteric compared to a Canon or Nikon, but a quick read of the manual soon sorts it out. Casio also redeems itself by providing a highly legible 2.8-inch LCD, so checking images is very easy. Card format is SD and SDHC, handy for all those HD movies and high speed shots. When we reviewed our test shots it became clear that while the F1 is an effective hybrid, you can't escape some compromises. The F1's sensor is only six megapixels, and while this will be enough to print images at A4, you will obviously lose detail when printing out larger ( or when cropping into images with software). On the positive side, the smaller sensor means that digital noise is less noticeable on stills, so long as you keep the ISO (light sensitivity) in the low hundreds. And while a 12x optical zoom is very handy to have, it's pushing it. Image stabilisation is built in, but it's almost impossible to avoid camera shake at the full telephoto end. Built-in image stabilisation or not, we'd strongly recommend a beanbag or lightweight tripod to get the most from this camera. Of course, the shake is less noticeable as you zoom out, and not having to keep changing lens is a big time saver. Considering the modestly-endowed sensor, image quality is reasonable so long as you don't take the quality level down. The quality Pentax lens limits aberration, while the processor delivers accurate, well-saturated JPEGs. Switch to video, and the F1 is just as convincing. The high quality rate makes a big difference, and there are some nice extras - you can zoom in mid-movie, or quickly toggle back to stills mode to take a snap. To conclude, the F1 is never going to put makers of SLRs or quality DV cameras out of business, but it's the best hybrid we've seen. 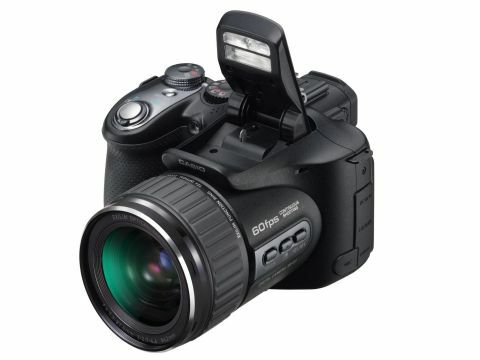 The 12x zoom, sheer speed and quality video mode make it a no-brainer for sports and wildlife fans. You are paying a premium for this clever combo, but we predict prices will steadily fall as we go into autumn. One to watch!